Fiber Flux: Free Crochet Pattern...Strawflower Hexagon Motif! Free Crochet Pattern...Strawflower Hexagon Motif! 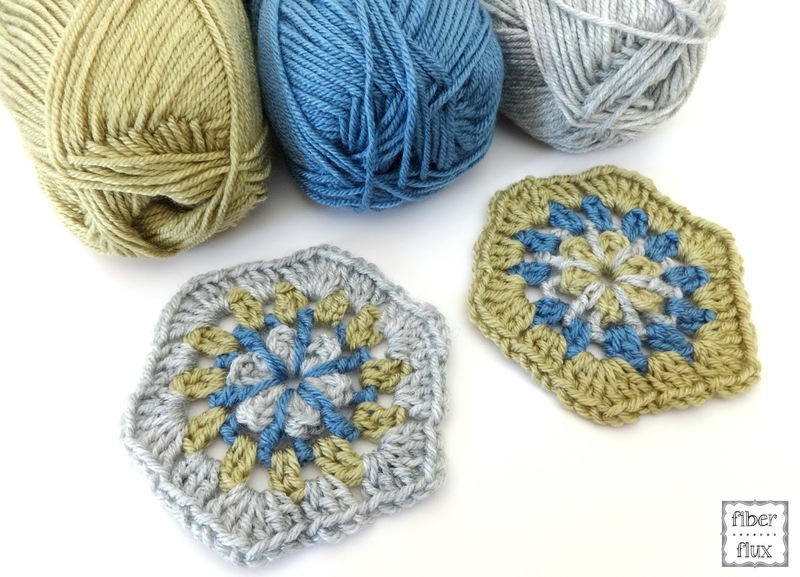 The Strawflower Hexagon Motif is a fun little project that has a dimensional flower in the center. Works up quickly and color changes highlight each round...have fun picking your own palette! This motif is part of our Blog Hop CAL, crochet along with us! A very special thank you to the good folks at Knit Picks for providing yarn for this project! Knit Picks Brava Worsted (Colors pictured: “Fig” “Dove Heather” and “Denim”) Note: Any worsted weight yarn will work for this pattern. Note: Each round is crocheted in a different color. When working with multi-colored projects, it is helpful to weave the ends as you go. Ch 4, join with a sl st in the furthest ch from hook to form ring. Round 1: ch 3, then work 2 dc, then a sl st into the center of the ring. Work *(3 dc, sl st) five times for a total of 6 petals. Join with a sl st to close round. Round 2: Tie on new color onto the back loops at the top of one of the petals. Insert your hook (same place at the top of petal) as if to work a back post stitch and ch 3 (working it this way will make the chain look more consistent with the other stitches). Ch 1, then in the next space (in between petals) work a tr into the center of the ring. Ch 1, then work a bpdc into the center most dc of the next petal. Continue in this manner around the circle, working a tr, ch 1 into the center of the ring (in between petals), then a bpdc, ch 1 in center dc of each petal. Join to close round with a sl st. Round 3: Tie on a new color into any space and ch 3. In the same space, work a dc, ch 1. Work 2 dc, ch 1 in each space around. Join to close round with a sl st. Round 4: Tie on a new color into any space and ch 3. In the same space, work 2 dc, ch 1, 3 dc, ch 1 (this will create first corner of the hexagon). In the next space, work 3 dc, ch 1 (this will create the first side of the hexagon. In the next space, work 3 dc, ch 1, 3 dc, ch 1 to make the next corner. In the next space, work 3 dc, ch 1 to work the next side. Continue in this manner, working corner, side, corner, side, etc until you have a total of 6 corners and 6 sides. Join to close round with a sl st. Note: To add rounds to the hexagon, simply repeat round 4, adding an additional side (in between the corners) for each round worked.